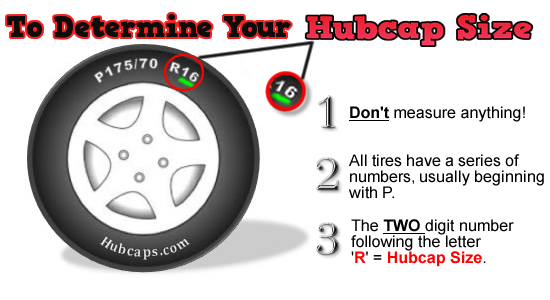 The purpose of this page & video is to show you exactly how to get the correct measurement of your hub cap. This is crucial to getting exactly the right fit for your vehicle! Please call us anytime and we will be glad to help you further 800-826-5880. Visit Hubcaps on YouTube and give us a "Thumbs Up"
Here at Hubcaps.com, we are not trying to get you to buy hub caps that are not necessary! Our goal is to instruct you on how to keep your hub caps & center caps on in the first place! Check out the cool videos we made to help you do just that! These "Videos" are found at the top right buttons of any page of our site. If you would like to learn how to keep your wheel caps on, these are a “Must See”. "Like Us" on Facebook and Google+!